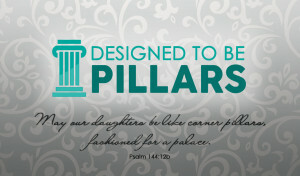 Designed To Be Pillars proclaims the truth of God’s love and freedom for women, empowering each to stand with courage in her unique design. Through directed Semi-Silent Retreats, women begin to experience God’s covenantal, unending love for them and how to remain in intimacy with God throughout life. Through teaching and preaching the feminine narratives of the Bible, women draw life-giving principles from Jesus’ treatment, teaching, and trust of women when He walked among them. Through teaching, women are able to understand and accept the person and work of the Holy Spirit in their own lives, identifying their Holy Spirit giftedness to work interdependently in Christ’s Kingdom. Through speaking around what we call, The FIVE Pillars of God’s Love for Women, based on the Word of God. intentionally and with great love. on the cross and Christ’s resurrection. single or married, equipping them to do His calling. always with respect, kindness, and the gift of hope. and instructed through these narratives, in life-long righteousness.